TSM 200 Complete Thermosyphon equipment for sanitary hot water production (ACS) by solar energy, 200l, brand Solimpeks. Prepared to produce ACS in a home between 2 and 3 people. For installations on flat surfaces and roofs. Solar water heater, natural system. No maintenance. It does not need magnesium anode, free of corrosion, hygienic, without Legionella and incrustations. Light weight tank, hidden behind the panels, with low pressure in the secondary consumption circuit. Thin selective titanium coating on copper surface. Quick and easy assembly (pre-assembled system). 1 360,00 € tax incl. Solimpeks's Thermosyphon system moves the fluid naturally and without any support through a pump. In the secondary circuit of consumption we use flexible stainless steel pipes as secondary circuit, the lime is reduced to the minimum and the pressure that receives the secondary circuit is the one that supports this stainless steel pipe of 36 meters. The TSM Thermo Accumulator tank has a polyurethane foam insulation, the outer cylindrical cover is steel coated with ST37 electrostatic powder paint of 0.5 mm and the inner tank is of 2mm thick carbon steel. This system has very low maintenance and does not need magnesium anode or expansion vessel. This is one of the most versatile and long-life systems in the market and at a very competitive price. 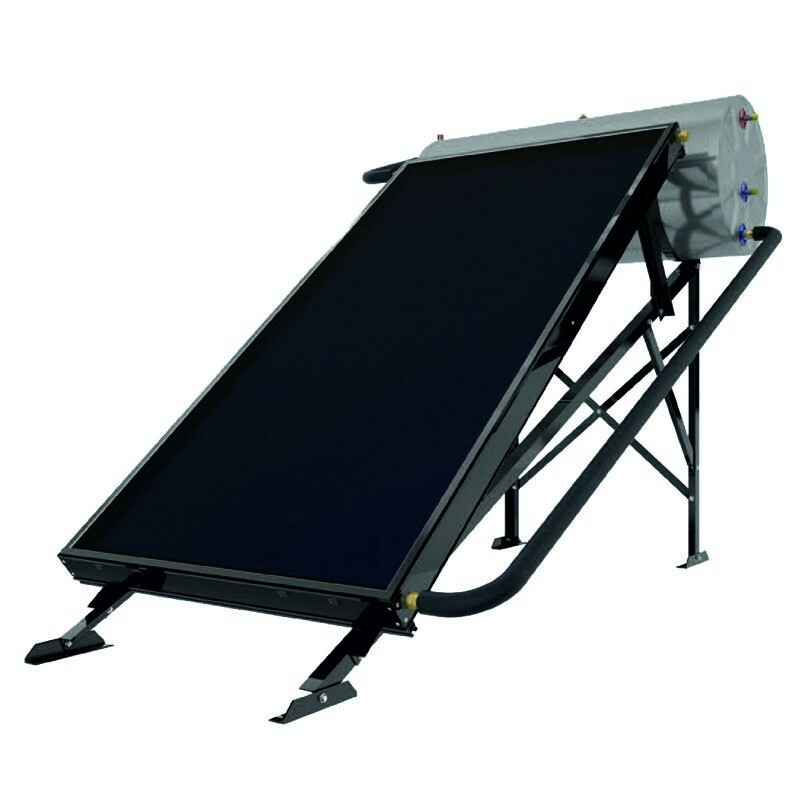 It is supplied with a structure for flat-roof mounting. For inclined roofs the clamping plates are sold separately. Ask for mounting and installation pricing.